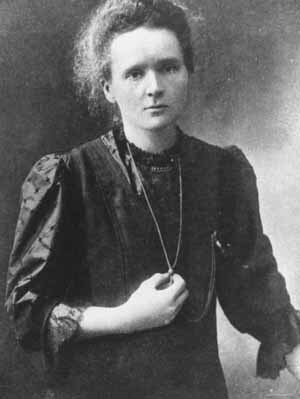 Marie Curie was a physicist and chemist of Polish upbringing and, subsequently, French citizenship. She was a pioneer in the field of radioactivity, the first person honored with two Nobel Prizes, and the first female professor at the University of Paris. Her achievements include the creation of a theory of radioactivity (a term coined by her), techniques for isolating radioactive isotopes, and the discovery of two new elements, polonium and radium. It was also under her personal direction that the world's first studies were conducted into the treatment of neoplasms ("cancers"), using radioactive isotopes. While an actively loyal French citizen, she never lost her sense of Polish identity. She named the first new chemical element that she discovered (1898) "polonium" for her native country, and in 1932 she founded a Radium Institute in her home town Warsaw, headed by her physician-sister Bronislawa. In 1896 Henri Becquerel discovered that uranium salts emitted rays that resembled X-rays in their penetrating power. He demonstrated that this radiation, unlike phosphorescence, did not depend on an external source of energy but seemed to arise spontaneously from uranium itself. Becquerel had in fact discovered radioactivity. Marie decided to look into uranium rays as a possible field of research for a thesis. She used a clever technique to investigate samples. Fifteen years earlier, her husband and his brother had invented the electrometer, a device for measuring extremely low electrical currents. Using the Curie electrometer, she discovered that uranium rays caused the air around a sample to conduct electricity. Her first result, using this technique, was the finding that the activity of the uranium compounds depended only on the amount of uranium present. She had shown that the radiation was not the outcome of some interaction between molecules but must come from the atom itself. In scientific terms, this was the most important single piece of work that she carried out.